This blog is about what international teaching is all about, how to do it, what is so great about it, and what is difficult about it from my experiences and perspective. In the two previous posts, I have discussed a little about how to get an international teaching job and how I got started in this global community. For the 8 years, I have been living and working overseas. I now consider the world my home. The discussions I have with my friends and colleagues are about where we are travelling on our next vacation, what we liked about the last place we travelled, and when you are planning to go home again. My neighbours are both next door but also in the next country or the next continent. My former vice-principal and his wife who lived across the hall from us in Shanghai, now live in Poland, while we are in Hungary. These are our neighbours! Last week, one of my best friends from university came to visit. She is currently working and living in Izmur, Turkey. She came to Budapest for a week long holiday and she brought 3 friends and colleagues from Ismur. One night we invited some of our Budapest friends over for dinner with our Turkey friends. One of my Budapest friends (H) is close friends with my best friend’s (M) Turkish friends. This person has pictures of both H and M on her fridge! These are the connections that can be made when you are international educator. Both my friends and I are moving around the world and making short term and lifelong friends. The connections are numerous. For our wedding, my husband and I received a beautiful framed world map from my husband’s sister. Coloured pins came with the map so that we can put a pin in the places we have visited, lived, or hope to visit. We can colour coordinate our pins. The yellow ones are for places either one of us or both of us have lived. The green pins are for places we have travelled together. 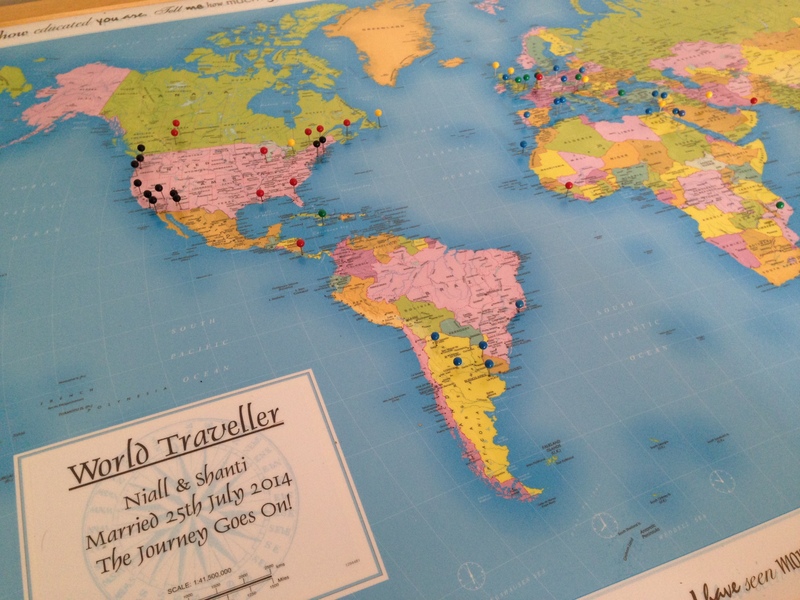 The red pins are for places that I have travelled and the blue pins for places Niall has travelled. The map filled up quickly and we ran out of pins. This is what international teaching is all about: having neighbours all over the world, making great friends and connections both short term and long term, and seeing the world!